So, this week had a few unanticipated bumps and I did not plan ahead. Just some lousy sleeping kids (and, therefore, mama) and a grandmother in the hospital in the midst of some other crazy stuff with my husband's side of the family. Grandma seems to be improving each day, and I am hoping to be almost as independent and stubborn when I am a few weeks shy of 91. 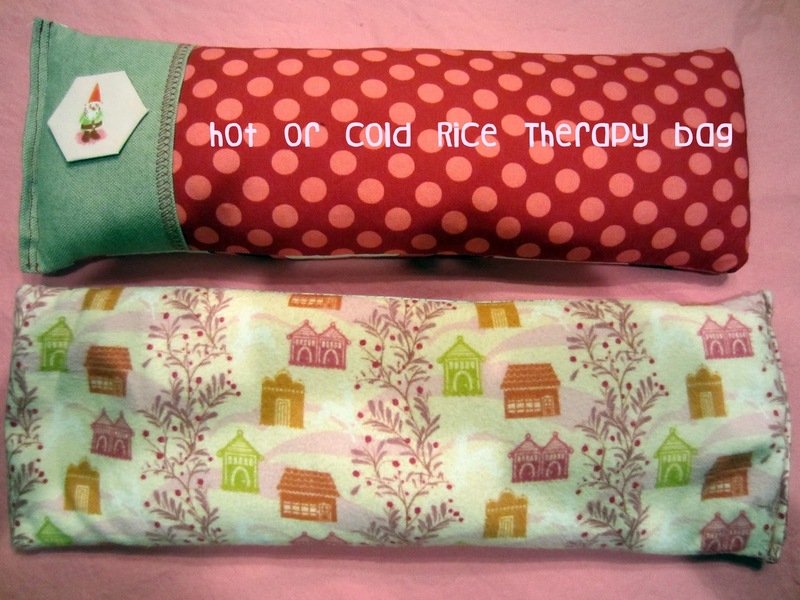 In any case, here is a rice therapy bag I made last year for the holidays. I was planning to revamp it with an appliqued heart, some embroidery and decorative stitching. What ended up happening was that I stuck a hexie on an old one for the sake of the photo. Unlike my snowmen hand warmers, which may or may not melt in the microwave depending on it's power, cook time and the composition of the fleece, I feel these are pretty safe if you stick with cotton. The how-to: Cut a piece of flannel (mine is Anna Maria Horner Good Folks) measuring 6x14", a piece of linen measuring 6x3.5" and a piece of your focus fabric measuring 6x11" With wrong sides together, sew the linen and focus fabric together on a short side. Press seam to one side and topstitch with a decorative stitch. Add a hexie (secure yours in place! ), a little embroidery or a raw edge applique on the linen side. Place linen/focus panel right sides with flannel and sew the two long sides and one short side together with a .5" seam allowance. You can do this with a serger. If you don't have one, you may want to stitch around again, 1/4" around your first seam (no one wants leaking rice).Turn out, press and fold the open end in towards the inside .5" around. Fill with rice and a few drops of essential oil. My top example is way overstuffed. The bottom one is perfect! 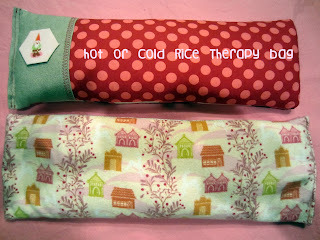 Hold the bag up so the rice falls to the bottom portion and make a line of straight pins across the bag to hold the rice to the side while you sew the opening closed. Pin around the top perimeter and stitch close to the edge to close the bag. Again, I would definitely do this at least twice! To use, you can store in the freezer to use after a tough workout or microwave it (I think they vary so much, but mine does well with 1 min 30 sec) for a sore back. It stays warm an amazing long time. I like to take mine to bed with me and put it near my always freezing feet under the covers. It's also nice to wrap around the back of your neck, it has such a nice weight. Thanks for bearing with me & I hope to have a better tutorial tomorrow!